What are dry runs and why are they an important part of Desert RATS? Dry runs are a critical aspect of any Desert RATS analog field test. After the objectives of this years field test were established, each team went to work on their aspect of the project. Engineers created solutions such as PUP, the Portable Utility Pallet. This device has stowage space, geological evaluation tools, and even a wireless mesh network repeater. As the field test approaches, each subsytem needs to be fully tested and evaluated. Sometimes this is as simple as a functionality test, however it can expand into finding ways to improve durability, usability, and even things such as ergonomics. Changes have also been made based on lessons learned from previous outings. The new automated suit ports will simplify exiting LER. Software such as the navigation system have been overhauled for ease of use and increased functionality. In the end the goal is a successful analog field test. This goal can only be met by insuring each subsystem has been integrated and tested. Desert RATS is about working together to achieve a goal that is unreachable independent of each other. Valuable lessons are learned here on Earth so that these systems are ready for the missions of the future. The Desert RATS is a NASA-led team of research partners working together to prepare for human-robotic exploration. This “working group,” led by NASA personnel, is comprised of both NASA and non-NASA Members. 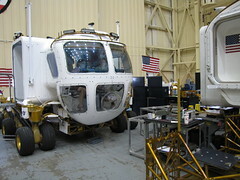 The Desert RATS field test activity is the culmination of the various individual science and advanced engineering discipline areas year-long technology and operations development efforts into a coordinated field test demonstration under representative (analog) planetary surface terrain conditions. The purpose of the RATS effort is to drive out preliminary exploration operational concepts for EVA system requirements by providing hands-on experience with simulated planetary surface exploration extravehicular activity (EVA) hardware and procedures. Author Rocky LindPosted on February 17, 2010 Categories UncategorizedTags Analogs, Desert RATS, field test, General9 Comments on What are dry runs and why are they an important part of Desert RATS? 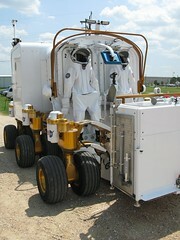 The Lunar Electric Rover (LER) is equipped with a time and space saving concept called suit ports. The suit ports are located on the aft bulkhead of the LER, and are designed to allow astronauts to quickly go from driving in a shirtsleeve environment to Extravehicular Activity (EVA) in their space suits. The suit port will allow the crew to enter and exit their EVA suits via a rear-entry hatch, while never having to bring the suit inside, keeping the internal cabin mostly free of dust. The suit port will also minimize the loss of consumables when it is depressurized for EVA, extending duration of an LER sortie. The crew uses alignment guides for docking to the suit port, and electromechanical mechanisms to lock and unlock the suit in place and also to open and close hatches. This is an upgrade from last year’s suit port concept that used all mechanically-actuated mechanisms with levers that the crew had to move. This suit port concept also includes an environmental shelter for the suits that will protect them from dust, thermal extremes, and micrometeoroid protection.